At the age of 27 wife of Yahoo! 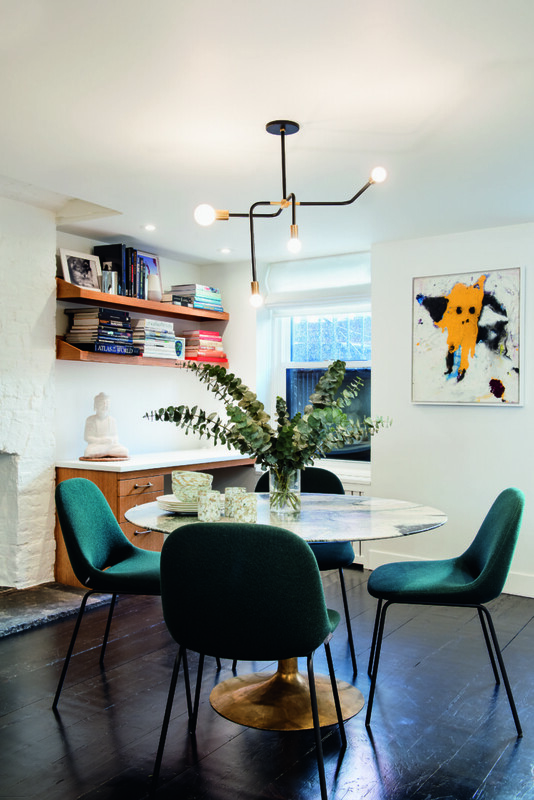 executive Adam Cahan, model Anne V almost at the same time found herself a real home - a three-bedroom apartment in the artistic New York area of ​​the West Village - and great love. "I brought things here two months before I met my future husband," Anna says this and gently caresses the sofa. "I felt like a man who discovered a treasure." In late 2014, Anna moved to San Francisco to Adam Cahan, senior vice president of Yahoo !. In 2015, they welcomed a girl who was named Alaska. A year later, Alaska's parents announced an engagement. But she was not going to give up the New York apartment, which all this time put in order the decorator Lucy Harris. It's still her treasure, her pied-à-terre is the second apartment, shelter, city dacha ... Call it what you want. "The repair was very modest," Lucy explained to me. - superficial repairs. Anna and I went to see the paints, fabrics, taps, window handles and discussed what we really need from this - only those things which impressed were renovated. It's not her main residence, so there was no point in reconstructing everything that was cleaned up. " A girl who spent half her life on the podium and knows the meaning of the word "look", compiled a list of things that needed to be changed in her apartment. Unappetizing green marble countertops in the kitchen. Dark and heavy, awkwardly restored doors. Floors or door jambs, because they did not fit together. "There was too much wood, as if it was an old Spanish house in the Los Angeles suburb of Los Feliz. Or a forest hut. Too dark. And I knew for sure that I want a light and airy house. White, if you can. Lucy Harris understood her perfectly. She started replacing the green marble in the kitchen by an artificial white Corian stone. I dismantled a wooden kitchen island. Put on new handles - also a way to facilitate the interior. All functional and comfortable. "I've never sat in the kitchen in my life, and now nobody couldn't keep me out of the kitchen". I wonder how the shape of the furniture transforms the space! The apartment did not change much, it just became brighter - and the feeling is completely different! "- Anna is very pleased with the result. Anna calls the padded tables "fluffy stools" - this is the favorite toy of her two-year-old daughter Alaska. Upholstery padding, Estilo Upholstery. Carpet "Low tide" design by David Rockwell, The Rug Company. ANNA CALLS THE BUFFET TABLES "FLUFFY STOOLS" - THIS IS A FAVORITE TOY OF HER DAUGHTER ALASKA. PUPPYING, ESTILO UPHOLSTERY. CARPET "BREAKDOWN" DESIGN BY DAVID ROCKWELL, THE RUG COMPANY. We were looking for a coach for a long time, and this one, Las Venus, was recognized as ideal: feminine, modern and not too simple. In the living room there must be a coffee table, but Harris offered an object instead of it that described the customer as "two tables that look like amoeba clinging to each other." They are soft, they can be disconnected or even moved to the wall - so that Anya and Alaska can turn around . "You know, in New York, few people have a place for a separate game room. And still I want to give daughter the opportunity to run around the apartment while I am doing something about the housekeeping. " I look at the young mother and try to imagine how she wipes the dust or cooks the soup. Almost done. She allocated space for for Russian books - there are mostly children's, but there is also a cookery. 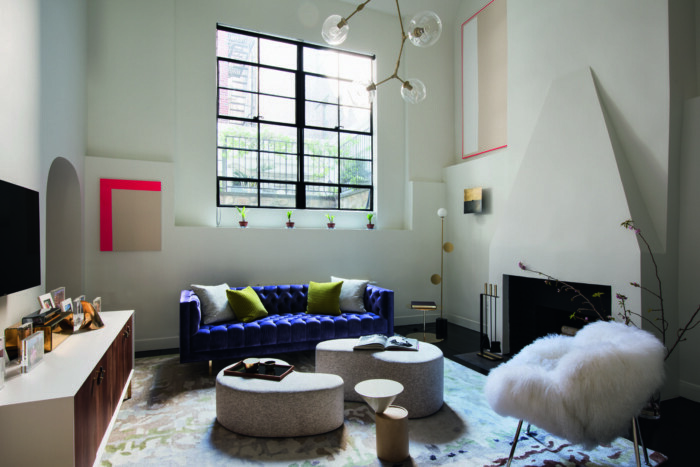 The sketch of the coffee table Lucy Harris painted herself, and the manufacture was commissioned by the Manzanares studio in Long Island City. The table has no sharp corners, and it looks, according to Lucy, "funny and not without the influence of contemporary art - so that brings a personal note to the interior." But, as far as I understood, Anya's favorite thing in the apartment is a modernist mirror over the fireplace in the bedroom. Lucy says that she almost went crazy, while she was looking for the right one. 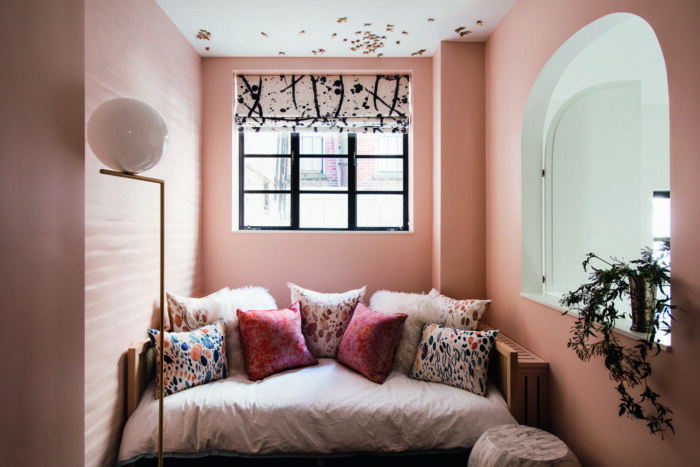 The search led her to the newly opened Bower furniture studio all in the same Brooklyn - and there she found her dream. Why is this a mirror? "Lucy looked at me in amazement:"
This is a New York apartment, and the spirit of it should be a new one, Anna spends a lot of time here, although this is not her real home. So, there should be as many items as possible from New York-based designers. " ​The woman who lived here before, put her whole being into that interior. Well, yes, her taste is very different from mine, but I wanted to keep some of her things. For example, a couple of stilts, like a cuckoo clock, they cover the window between the nursery on the top floor and the living room with a high ceiling. "Charming! You look and feel that you are part of a large apartment." The mirror at the front door is Apollo Mirror, the design of Ben and Aya Blank for The Future Perfect. 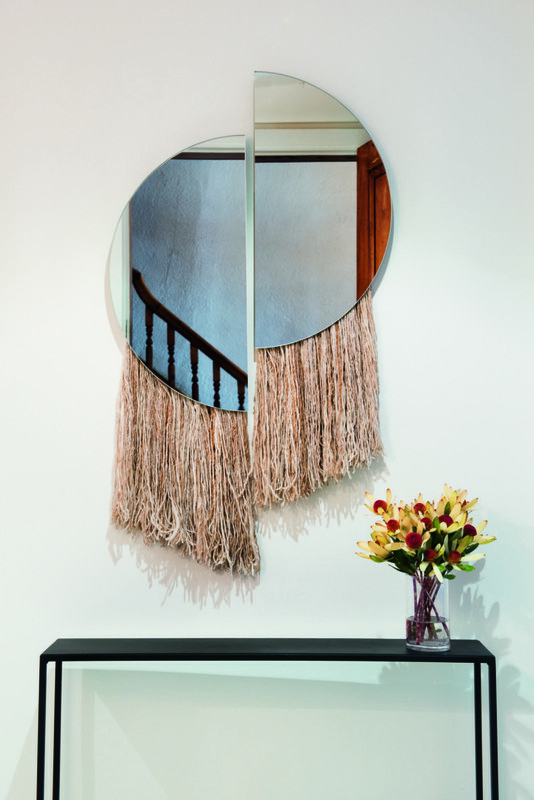 MIRROR IN THE ENTRANCE DOOR - APOLLO MIRROR, DESIGN BY BEN AND AJA BLANC FROM FOR THE FUTURE PERFECT. Anna and her decorator Lucy Harris were going to buy the famous round table of the times of his great author Eero Saarinen, but then they chose the modern version. ANNA AND HER DECORATOR LUCY HARRIS WAS BUILT TO BUY THE FAMOUS ROUND TABLE EERO SAARINEN, BUT THEN CHOOSE THE MODERN VERSION. Fashion cabinet: albums, candle Diptyque and advertising Chanel Chance, in which the model Anne V starred in 2001. Children's room with an arched window that opens to the ceiling in the living room. The wooden island in the kitchen Anna dismantled, the walls painted white, and put on new handles.